Home > Overview > Questionnaire: Storage Heaters or Central Heating? This used to be such an easy question to answer – it was gas-fired central heating every time. Not only does central heating fit in better with the demands of family life but it used to be far and away a cheaper way of heating a home. Add to that the convenience of drying clothes on water-filled radiators, something you can't do with storage radiators, and it was gas winning hands down every time. Major fluctuations in energy prices and demographics are beginning to blur the lines though. Consider the higher levels of insulation being forced into new homes by government legislation and the growing number of people at home during the day instead of being at work and storage radiators don’t seem to be at such a disadvantage. 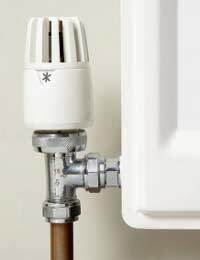 Gas-fired central heating heats water in a boiler and then sends it around a network of pipes and radiators. With a combination of thermostatic controls and programmable timers, it can be made to come on and off at will and only takes around half an hour to start producing heat. Using gas to heat water was generally cheaper than using electricity, so the running costs were lower. The major downside is that installing the system, running the pipes around the house and installing the boiler, is much more difficult than with storage radiators so the initial installation cost is higher. Electric storage radiators use electricity to heat up thermally efficient bricks overnight which then release their heat during the day. They are easier to install because they are just connected to the electrical circuit and there is no central control. There is also very little to go wrong so there are no leaks, no noisy gurgling pipes and no vales or pumps to break down, so as long as there is electricity you will have heat. The downside is that there is very little you can do if the bricks cool down and lose their heat. Modern storage radiators are better insulated these days and have fans to provide a boost in the evening, but if they have already lost their heat, which they will if your house is drafty or poorly insulated, you will have to resort to other methods of heating to warm up. Some (more expensive) storage radiators have a separate heating element which can provide spot heat on demand from the ordinary electricity supply but they are relatively expensive to run. If you are consider a new heating system and aren't sure which way to go, ask yourselves the following questions. Is your house very well insulated (or could it be)? Do you stay at home during the day? Do you rarely stay up late at night? Is it important to save money on installation? Are you in an area that has no mains gas supply? Do you have a small home, a one-bed flat, for example? Is your daily timetable quite constant? Are you adding the system to an existing property? If the answers to all of the above questions is yes, then there is a good chance that storage heaters could work well for you. The key to keeping the running costs down will be to super-insulate the house and invest in up-to-date storage radiators. If the answers to some of the questions is no, then you are less likely to be happy with storage radiators and consider a full central heating system, oil or LPG fired if you aren't on mains gas. If you are building a new home or doing a full renovation, you should consider central underfloor heating which is far superior to a radiator based system. It's more expensive to buy and install than a traditional system with radiators but if you have to put new floors in anyway then the extra cost isn’t so great.